The Law Office of Bloom & Kinnear is a full service law firm dedicated to the representation of accident victims who have suffered serious personal injury resulting from car accidents, truck and bicycle accidents, as well as, slip or trip and falls, medical malpractice and wrongful death. 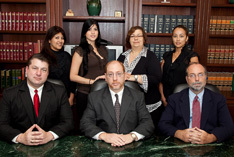 Our office in Miami-Dade County but we serve clients in Broward, Palm Beach and Monroe Counties as well. We get our clients the compensation they need and deserve when they are injured because of the negligence of others. As detailed in our website, we accept representation of all types of personal injury cases, including those involving car accidents, defective products, elevator/escalator, boating, brain damage, animal attack and serious injury claims. We take pride in representing the working men and women in Florida when they have suffered injury due to a work accident. Additionally, we protect our clients from unscrupulous employers who unlawfully coarse or fire them from their job because of their claims for workers' compensation benefits. Through our involvement in the legislative process and various organizations, including Florida Workers Advocates, an organization whose purpose is to fight for the rights and benefits of injured workers in Florida, we promote fair treatment for all Floridians.